SOLOMON is the best place for math! Why is Solomon Academy the best at math? Solomon Academy is a prestigious institution of learning with numerous qualified teachers of various fields of education. Our mission is to thoroughly teach students of all ages and confidence levels, elevate skills to the highest standards of education, and provide them with all the tools and materials to succeed. Solomon Academy consists of intellectually stimulating lectures, thorough practice through quizzes, homework and help sessions to help students train their skills and confidence to their highest potential. 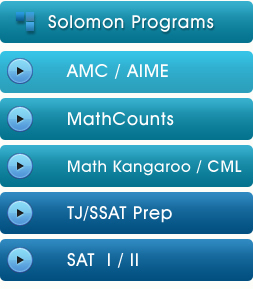 Prior to enrolling at Solomon Academy, students are required to take a test that determines their level and the appropriate class for each student. All of the math classes thoroughly cover concepts and reinforce them with practice exercises and homework so that students can strengthen their skills. Summer Classes is now Open! We offer a variety of classes, English and Math, for students of all ages. Please feel free to take a look at the schedule and contact us with any further questions. We are proud to announce that Solomon Academy has published a TJHSST Math Work Book, available on Amazon, to help students successfully master the Quant Q Math Test. The book contains 14 lessons and 10 full practice tests with detailed solutions and explanations for all problems. ©2019 Solomon. All Rights Reserved.